It all started when my sister wanted to do some adventure travel, she wanted to climb Kilimanjaro. Now I like adventure travel but 19,000 feet sounds a little too much like suffering to me. So I suggested we try Peru first and see how we do at 14,000 feet first. I visited Peru in 2011 and loved it and really wanted to walk the Inca Trail to Machu Picchu, the lost city of the Inca. 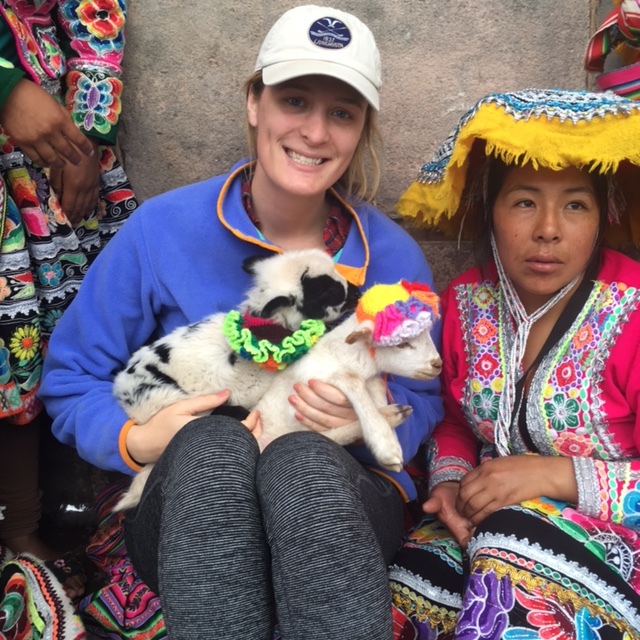 One thing lead to another and the result was two sisters–Melissa and me, two daughters—Alexandra and Anne, and two friends–Lisa and Melanie– all with tickets to Peru. Alexandra came from LA and met me in Miami where we flew together to Lima and spent the night at a hotel near the airport. 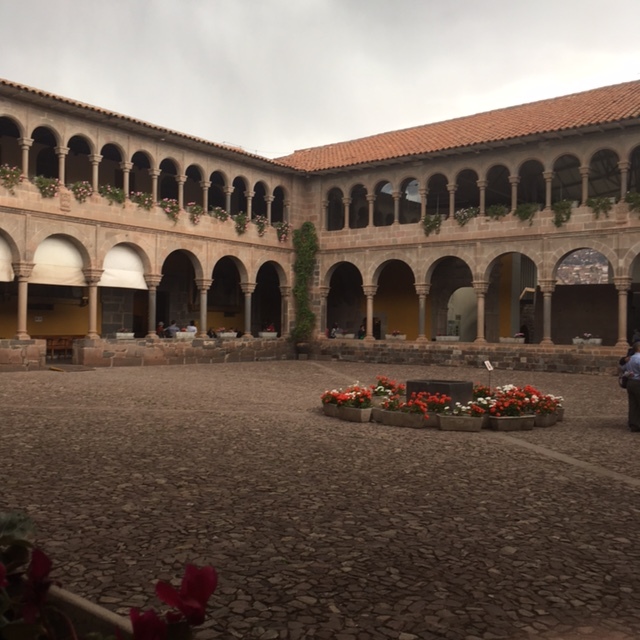 The next morning we had an hour flight to Cusco in the heart of the Andes and the Inca Empire. 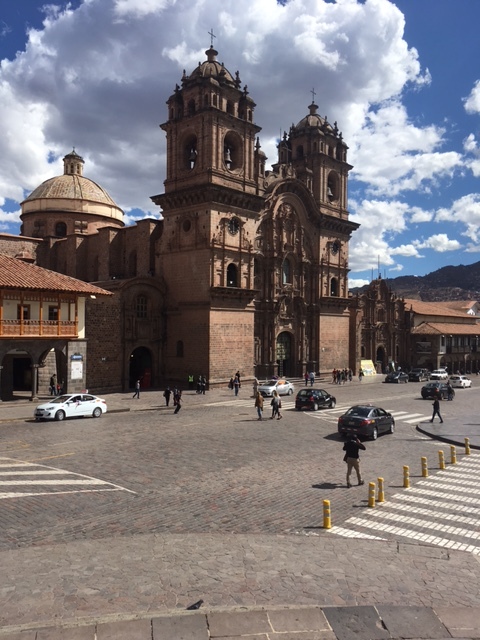 The population of Cusco is about 700,000 and the altitude is 11,000 feet. I had a local guide Wilfredo (www.toursbylocals.com) pick us up at the tiny airport. Our first stop was a traditional lunch with potatoes and chicken, soup and avocado. 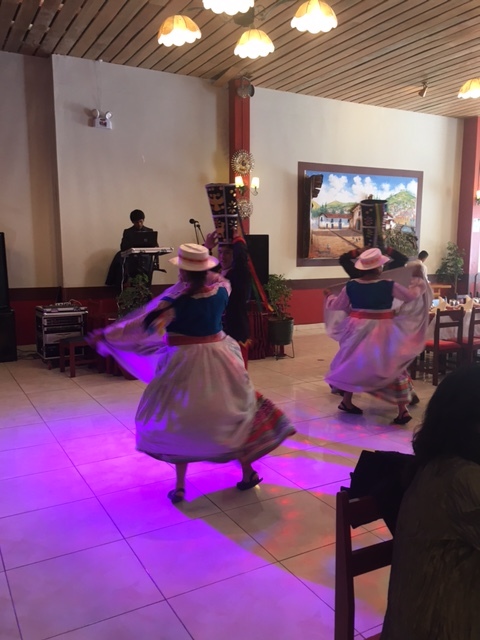 There were two couples performing a traditional dance to give us the full experience. Next stop was the cathedral in the main square. Built in the 1500’s, it is a gold and silver extravaganza with ornate carvings and saints. Tucked in a corner is a large painting of The Last Supper where Jesus is offering guinea pig instead of bread to the disciples. There is a black Jesus nearby which beautifully reflects the local culture and the universal love of the Christ. 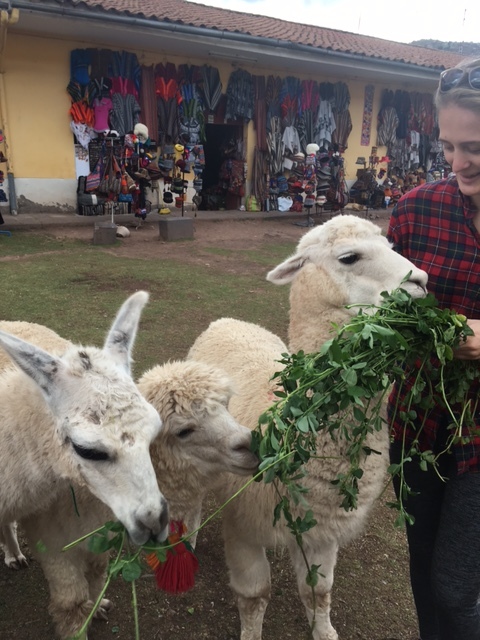 On our way to Qurikancha, also spelled Coricancha, the Sun Temple of the Inca, we got Alexandra’s first alpaca fix. I promised her baby animals so an enclosed courtyard with puppies and kittens and alpacas was a great delight. The owner brought out a big handful of alfalfa so we could feed and pet them. A few streets down were women in traditional dress holding lambs with little knit hats. That was good for another round of cuddles. 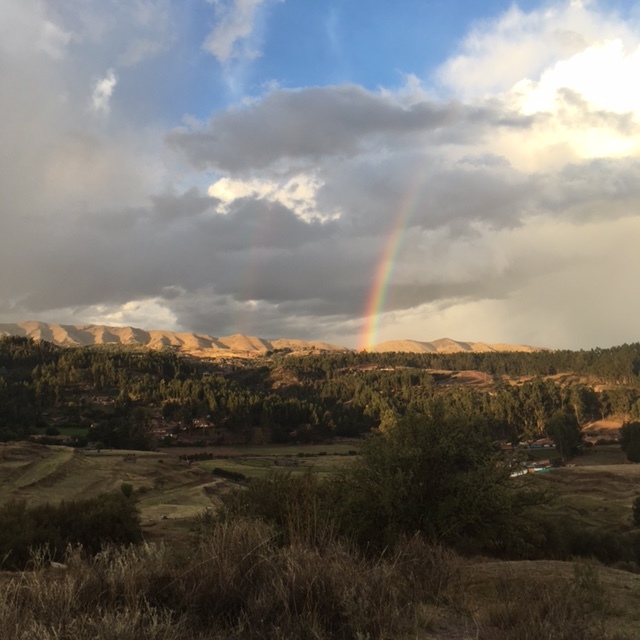 Qurikancha is built from the Inca stones that are so precise that there is no mortar or space between the stones. They have internal notching like legos that make them earthquake proof. 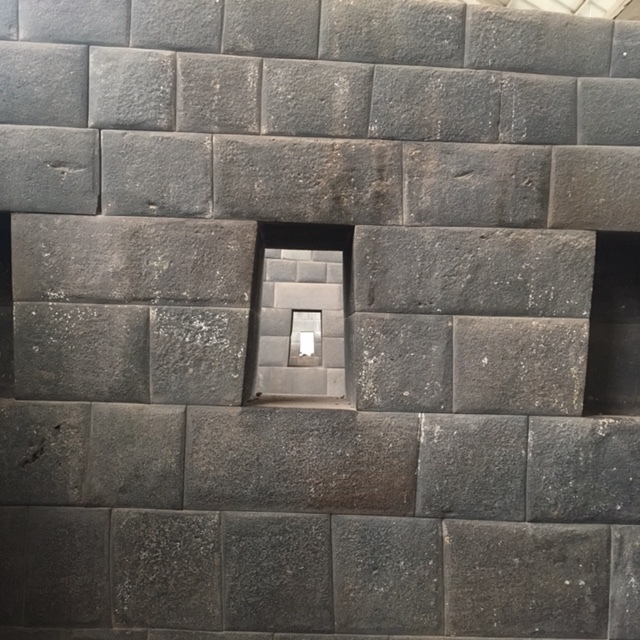 The Incan walls surround a monastery that the Conquistadors built on the site after removing tons of gold from the original temple. 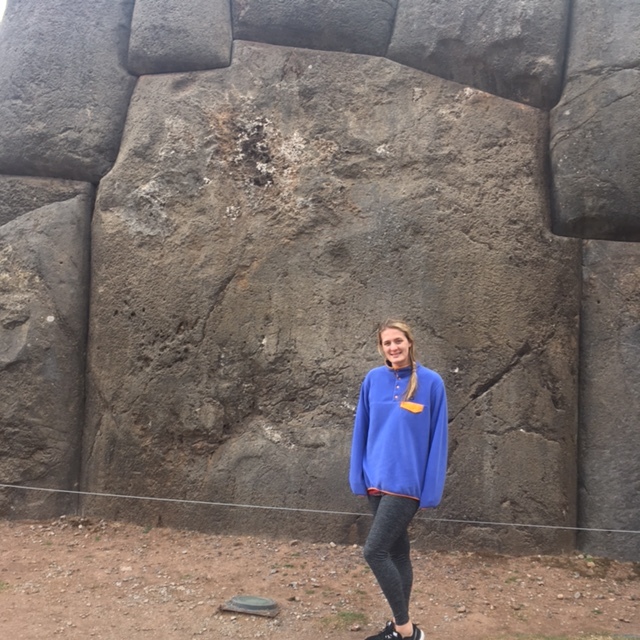 The final stop was Saqsaywaman, another Incan site on an epic scale. Massive stones were quarried and again precisely cut to build this ceremonial complex. You can see how massive the stones are because Alexandra is six feet tall and this single block of stone is many feet higher. 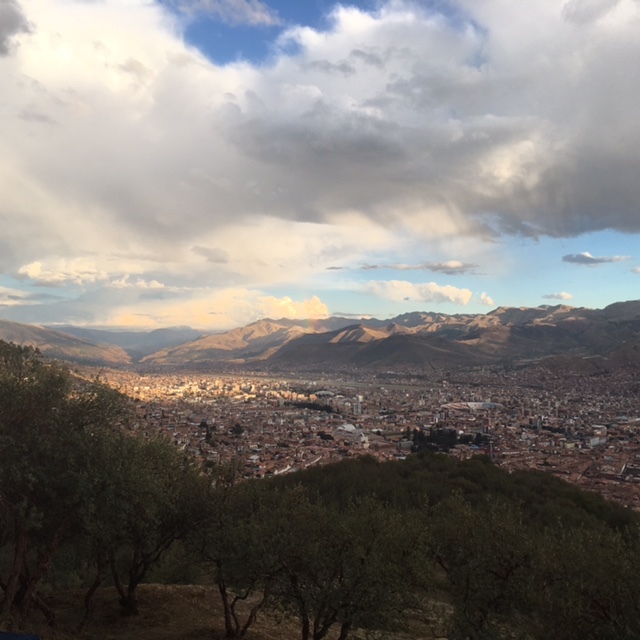 We then climbed up to the top for an amazing view of Cusco in the valley. Storm clouds were all around giving a beautiful combination of pink sunset and dual rainbows. It had been a long day and we were happy to see our charming hotel (Tierra Viva Plaza) just off the main square. Some pizza was the perfect ending to the day. This entry was posted in Animals, Peru by theperpetualpilgrim. Bookmark the permalink.